When I first saw this theme, I thought it said "malicious." But, it doesn't. 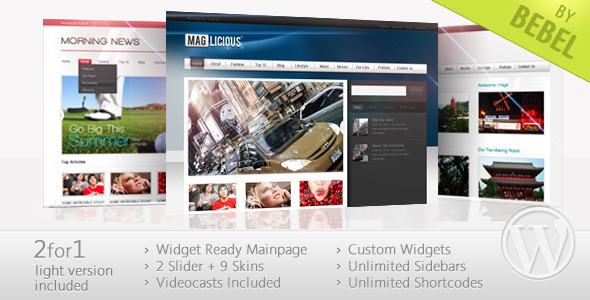 At any rate, this theme is a 2 for 1 with a widget-ready homepage, 2 sliders, 9 skins, videocasts, custom widgets, unlimited sidebars, and shortcodes. I believe the name was meant to be a play on the words "magazine" and "delicious," not a variation of "malicious," but there's no way of knowing with any degree of certainty.